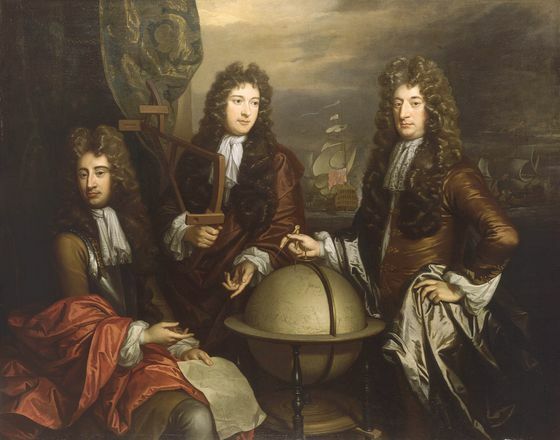 A triple portrait of Thomas Phillips, John Benbow, and Sir Ralph Delavall. It probably relates to British fleet operations against the north coast of France during 1692-93. The officer seated on the left holds a plan of fortifications, and is believed to be Thomas Phillips, the fleet’s chief military engineer. Highly distinguished, he was involved with John Benbow at the bombardment of St Malo. He wears a leather coat and breastplate with a red silk drape over his right arm. His portrait was probably painted in 1692-93 before the summer campaign of 1693 from which he did not return. The central figure is John Benbow, Admiral of the White, three-quarter length facing to right. He wears a brown silk robe, a dark brown full bottom wig and holds a quadrant in his right hand. Benbow’s early career was in the Merchant Service where he gained a reputation as a seaman and a fighter of Barbary pirates. He entered the navy as captain of the ‘York’ in 1689 and the following year became master of Admiral Torrington’s flagship, a post equivalent to the Navigator of the Fleet. He was involved in the battles of Beachy Head 1690 and also at La Hogue. The figure standing on the right is Sir Ralph Delavalle who was Admiral of the Blue. He is shown three-quarter length and wearing a brown silk coat and dark brown full bottom wig. His right hand rests on a celestial globe holding a pair of dividers. His left hand is on his hip, holding a blue silk drape. He served in the Second and Third Dutch Wars and commanded the ‘Constant Warwick’ in 1674. In 1688 he had command of the ‘York’ and supported William of Orange at the Revolution. He directed the blue squadron with distinction at the action off Beachy Head in 1690. During the winter of 1691-92 he blockaded Dunkirk. Delavall was Vice-Admiral of the Red squadron at Barfleur and destroyed the French flagship ‘Soleil Royal’ and two other French warships at Cherbourg. He commanded the rear squadron at La Hogue, 1692 and, in January 1693, was appointed one of the admirals who jointly commanded the fleet with Killigrew and Shovell. Following the loss of the Smyrna convoy the Government dismissed him and this ended his career. The painting was engraved by W. T. Moto during the 1830s and an oval half length stipple print was made by G H R B Pook and published in 1808.